MM's Kitchen Bites: Punjabi Kadhi Pakora ( Fritters in Spiced Yogurt Gravy) ...Slurp, Slurp, Slurp!!! 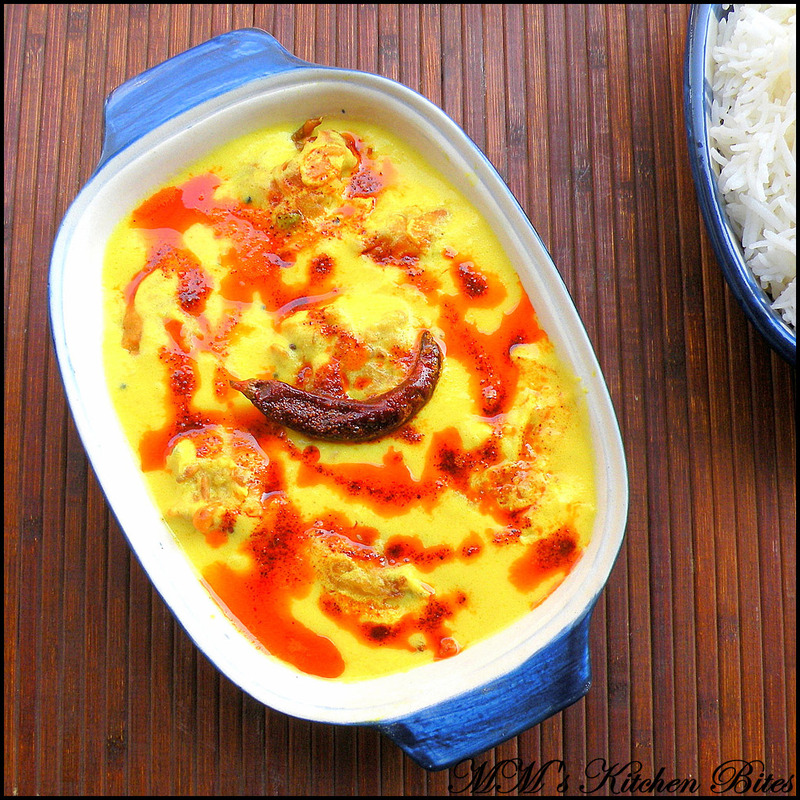 Punjabi Kadhi Pakora ( Fritters in Spiced Yogurt Gravy) ...Slurp, Slurp, Slurp!!! 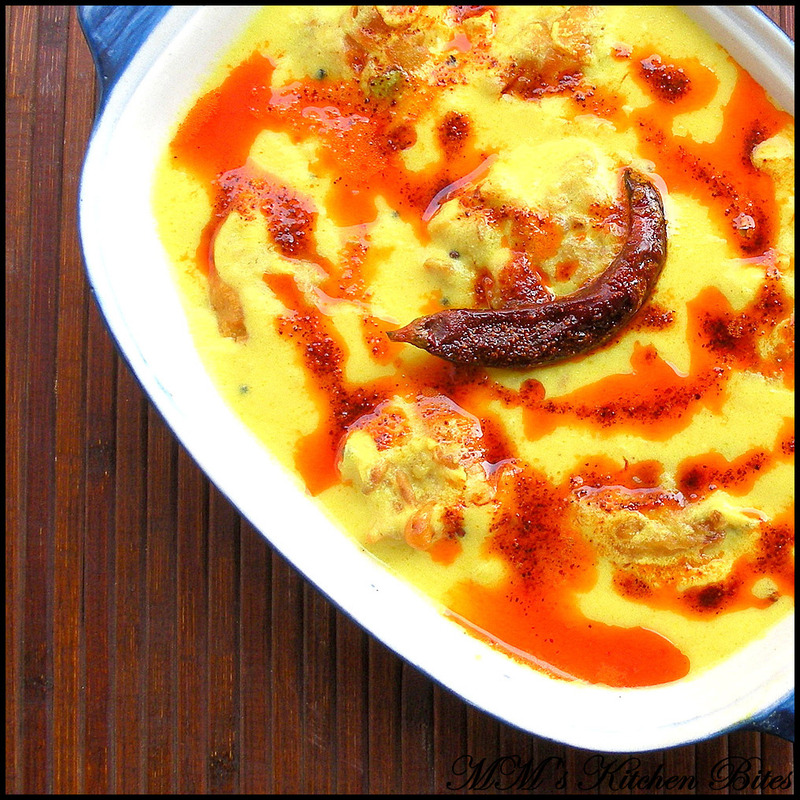 Punjabi Kadhi Pakora…A Punjabi home or blog by a proud Punju (is there any other kind?? J ) is incomplete without a Sunday lunch of Kadhi Pakora…so go cook…and slurp, slurp, slurp!!! Combine the besan, yogurt, salt, turmeric powder and water in a large bowl and whisk well so no lumps remain and let it stand for about 5 - 10 mins. If you still see lumps in the mix, pass the mix through a fine sieve. When the seeds crackle, add the asafoetida, curry leaves and dried red chillies and stir for about 10-15 seconds on low flame. If using onions (instead of nigella seeds), add now and sauté till they go soft. Add the ginger and garlic pastes and sauté till fragrant. Once the kadhi is ready to be served, do a second tempering with whole dried red chilli and powdered kashmiri red chilli powder. Pour it on the kadhi and you are done. You can additionally garnish with fresh coriander leaves. Serve with Basmati rice or tandoori roti. For a hassle-free version, just increase the quantity of onions in the beginning and let them simmer with the kadhi. While the kadhi is simmering, you can get on with making the pakoras. Mix all the ingredients with enough water to make a thick paste. The paste is thicker than that of usual pakodas, so that they are a little harder than usual or they will break when simmered with the kadhi. In a kadhai/wok, heat sufficient oil for deep frying. Drop spoonfuls of mix into medium hot oil. Fry till all sides turn nice pale golden brown. Use a slotted spoon and scoop out. Set aside and drain on paper towels to be used after the kadhi is cooked. Curry leaves are usually not added, but in my home kadhi has always been made with curry leaves. There are versions with adding coriander seeds or skipping garlic – you can pick and choose what you want to add in. Similarly, there are versions with only one tempering in the end or skipping the second tempering completely – again, entirely up to you. The only must is that the yogurt needs to be sour – so taste the yogurt the previous night, if it is not sour – put some salt in it and leave it overnight on the kitchen counter.